A weather station is one of the most important instruments that allow individuals and organizations alike, to gauge the weather conditions of their environment. It’s a highly specialised product that’s targeted towards a niche market segment. Arguably, weather stations are extremely important tools for conducting research. Before we get into the workings of a weather station, for the common benefit of all, let’s get a clearer idea of what a weather station is. In simple words, a weather station is a device that collects and records data about the atmospheric conditions prevalent wherever it is stationed. For example: A weather station that’s placed in your neighborhood can help you obtain weather-related data about your neighborhood only. On first-thought, majority of the population is of the assumption that a weather station is a highly technological device that uses some kinds of sci-fi sensors to predict weather. But no, that’s not how they work. Multiple-weather measuring tools are combined to form a weather station. In fact, you may just be familiar with more than one or two of these tools. So if you question is, ‘How does a weather station work?’ Then, the simple answer for that is that these devices work using ordinary sensors to measure atmospheric conditions like temperature, rainfall, humidity, atmospheric pressure and even wind speed and direction. A weather station will be having plenty of sensors. Some expensive models will be having high quality sensors. However, most of the works for the same purpose. Thermometer: A thermometer is a temperature-measuring apparatus with widespread applications. As a part of a weather station, a thermometer records data relating to the highest/lowest temperature, average temperature, indoor/outdoor temperature variations etc. There are three ways by which a thermometer can work. Using thermocouples, thermistors or PTD probes. Barometer: A barometer is a simple device that measures the atmospheric pressure of air. As an integral component of a weather station, it allows users to analyse changes in the atmospheric pressure. Changes in the atmospheric pressure impact the weather conditions and hence, a barometer is a very useful measurement tool. It works by finding out the amount of pressure applied by the air on a particular surface area. Hygrometer: A hygrometer is used to measure the level of humidity that’s present in the air. Important data such as absolute humidity, relative humidity, percentage of humidity etc. is obtained through data collected by this instrument. Generally, a hygrometer is placed close to the thermometer as temperature has a great influence on determining humidity levels. Anemometer: An anemometer is used to measure the speed and direction of winds. So there are many different kinds of anemometers, each offering different benefits. Cup anemometer with wind vane, sonic anemometer and propeller anemometer are the three most popular types. Each work differently. However, at the end of the day, they record the same data such as fastest wind speed, wind direction, avg. wind speed, etc. Rain gauge: A rain gauge is a simple device that measures the level of rainfall that an area receives. Just as in there are many different kinds of anemometers, there are many different kinds of rain gauges too. The principle upon which they work is what differs them from one another. The most popular type of rain gauge is the one that works on the tipping bucket principle. Apart from basic sensors, AcuRite and Ambient has introduced weather stations with lightning detector feature where it’ll alert you if any lightning detector near your locality. It’s a new feature introduced in 2017. Integration With Google Assistant and Alexa. We’re progressing into Artificial Intelligence future. With legends like Elon Musk has been working on OpenAI, we can expect most of the industries will be introducing Artificial Intelligence. 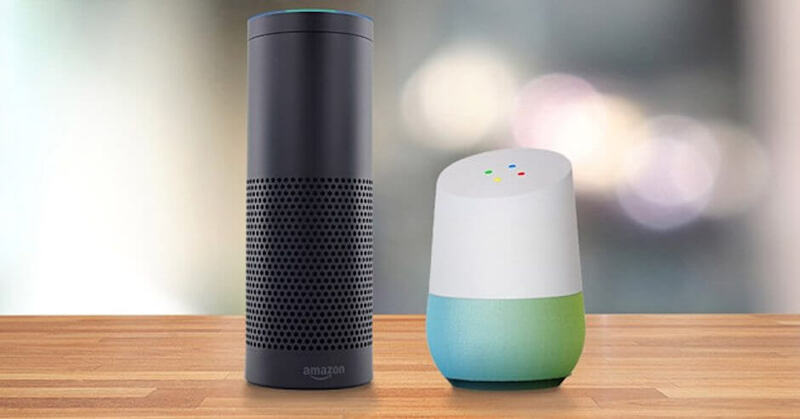 Ambient has integrated Alexa and Google Assistant compatibility. You can use commands like “Outdoor conditions, Yesterdays report” to retrieve the weather data.